Depending on the age of the kids, have each child bring a small backpack filled with their toys and goodies for the flight. Avoid those really cute pull bags, as inevitably they turn as the child pulls, the child gets upset, and you end up carrying a very unmanageable bag in addition to your own carry-ons. When possible, load their bags with some of the other things that you need, such as bottles, diapers and wipes. Even very young kids can carry a small backpack filled with their own diapers. This saves you space in your bag and makes the child feel like a “big” boy or girl. When traveling with a baby, always make sure to have an extra bottle and formula in case you lose one. In addition to the main carry-on that will most likely end up overhead, pack one small bag with absolute essentials that will always be with you. Make sure to have enough formula for one bottle, spit up rag, one diaper and a few wipes and one small toy. This way you do not need to search overhead for a diaper change. If you nurse, make sure to wear something that is loose and bring a light blanket or make sure to get a blanket on the plane when you board. ALWAYS bring an extra pair of clothing for all the children and for you as well. Trust me, you do not want to spend the flight covered in vomit or anything else that seems to happen when traveling. I know that some people give their kids medication to relax them for the flight. I personally can’t suggest this one as I had a bad experience with a reaction where not only didn’t it make my child sleepy, but did make her throw up the entire flight. If you do want to give medication, be smart and try it out ahead of time. And definitely make sure to check with your doctor to give the proper amounts as sometimes with flying amounts differ. When checking in, always double check seat arrangements and kosher meals. If traveling with a baby, make sure the bassinet is reserved. If you do not have a bassinet row, always try to sit at the very back of the plane. If you are checking through a stroller, you will anyway have to wait before you can depart. You will have more storage room at the back of the plane. You will bother the other passengers less, have more help from the flight attendants, and be right near the bathrooms which is essential when changing diapers or with children who simply can’t wait. If there are no bassinets or when traveling with a baby under 2, bring a car seat onto the plane with you. If there is an extra seat (and the car seat is FAA approved) you will be given the extra seat for the baby. If not, then they will take it from you and put it underneath. This is a great option if you need a car seat where you are going. If not, it is probably not worth shlepping. Because of the new security regulations, make sure you and the children are in shoes that are easy to get on and off. Before taking off the children’s shoes, double check with security if it is necessary, since depending on the type of shoe, often it is not. While waiting for the flight, let the kids walk around, let the baby crawl, use this time for exercise. This is not the time to sit still, the whole flight they will need to, so now is the time to use that energy. If you are traveling alone or with a few young children, either make sure to have a double stroller and baby in carrier, or buy a child leash, they look terrible, but it is a lot better than having a toddler run away in a busy airport!!! Make sure everyone uses the bathroom before boarding and change diapers, even if they seem to be clean. Before preboarding is called, maneuver right to the front, close the stroller and be ready to get on. When traveling with a baby or even a toddler, bring a carrier to put the child in so that you can pull the folded stroller to the plane. This way you are not trying to hold the baby and close the stroller at the plane door. Well before boarding time, go to the front desk and ask for a stroller tag so that you are ready to go. Do not ask when it is time for boarding. Make sure to have a pocket or place to hold tickets and passports so they are readily available. Do not bring one bag of chips, one bottle of juice, etc. when traveling with more than one child, as you do not want to have to deal with them fighting over who gets more. Each child should have a little closeable bag (preferably one that really seals) with his or her name on it, and identical snacks, so everyone knows exactly what is theirs. For treats, buy small sucking or individual chewing candies that you can distribute and never end up in hands but go directly to the mouth. I have found that the necklace or bracelet candies are the best. The kids feel like they got a present, and it keeps them endlessly entertained, especially because it takes them forever to bite off the candies. Give each child a small pack of crayons as opposed to bringing one large pack. This way there is no fighting over colors. Pack toys that do not have pieces and do not require numerous things to work. Better even than a coloring book and crayons is a doodle pad with the coloring stick attached that can erase and start over. Bring books that you can read to the kids, but make sure they are light and compact. Buy cheap little notebooks and packs of office stickers (the colored round ones.) Give each child their own notebook and a few pages of stickers and let them make their own creations. During takeoff and landing, make sure to have kids drink or chew gum. Make sure the baby is either nursing or drinking a bottle. Explain to them what is happening, and if they are too small to see out the window, play a game where they have to tell you when you are finally in the air or when you have finally touched ground. Once you land, let the other passengers off first. Make sure you have everything and carry baby in carrier until you exit so your hands are free for the other kids. If you need help, ask. In many airports, those little carts are available to help people traveling with small children. And just one final tip, or at least comforting thought, no matter how bad the flight is, no matter how terrible your children behave or how long your baby may cry, sooner or later, the plane will land, you will exit, and hopefully never see any of those people again! If possible, schedule the flight around your child's sleep schedule so your child will spend as much time napping/sleeping as possible. 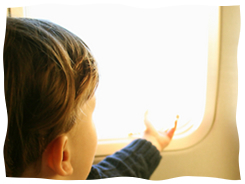 Also, if you have a window seat, window gels are a great source of entertainment for children.